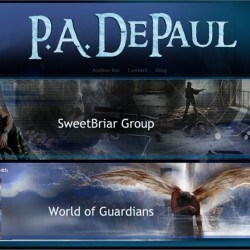 PA DePaul is a multi-genre romance author including paranormal fantasy, and romantic suspense. She has a full-length paranormal romance debut titled Guardian Redeemed; and is currently working on a romantic suspense series. She originally hails from Carroll County and Baltimore County, Maryland, but also lived in Macon and Warner Robins, Georgia. She currently resides in a beautiful community just outside Philadelphia. When her head is not completely absorbed with listening to her very demanding characters tell their stories, she can be found with her nose in a book—not only enjoying the story but studying what makes the novel work. She loves action-adventure movies (if it blows up spectacularly, she’s there) and watching way too much TV. (Can everybody say “Procrastination?” To which she usually replies, “But it’s research!” Yeah, they don’t believe her either.). More times than not, her husband and Shi Tzu stand outside her closed office door wondering, “Is she still alive? Do we dare bother her? What if she’s on a roll?” Monty usually answers by scratching on the wood anyway. Gotta love a dog who doesn’t care about boundaries! Good thing he’s so cute! You can visit her at www.padepaul.com or www.facebook.com/padepaul or https://twitter.com/PADePaul.